DeckStainHelp.com has become the Internet’s go-to site for all things exterior wood surface restoration related. New this year is Restore-A-Deck in a day, which was not mentioned in the article below for it’s ability to withstand the elements when your deck is in full sun. We encourage customer interaction on our site, so feel free to leave a comment. One of the biggest elements in the lifespan of a deck is sun exposure. When a deck is exposed to full sun, it can have a damaging effect that can shorten the life of the wood. 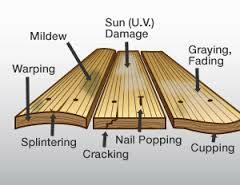 Harmful UV rays break down the wood fibers and cause discoloration, graying, and fading. When a deck becomes severely sun damaged the decking boards can warp, crack, and split causing dangerous splinters and a very unappealing look. In extreme cases, UV damage is irreversible and cannot be repaired. The best stain for full sun decks is one that has a heavy pigmented formula that acts as a sunscreen and blocks damaging UV radiation. Most of the stains that are best for full sun decks will penetrate deeply into the wood pores. For example, Defy Extreme is an excellent waterborne product that uses nanoparticle technology and heavy resins to help reflect harmful sunrays. We appreciate when people write in and ask for advice when something goes wrong during their deck staining projects. Today we talk about what causes your deck stain to turn black after a year or two and what to do to get rid of the problem. We appreciate your input, so feel free to leave a comment below with pictures of your deck stain projects. Why Did Your Deck Stain Turn Black? Many things can happen to a deck stain when it is not applied or maintained properly. 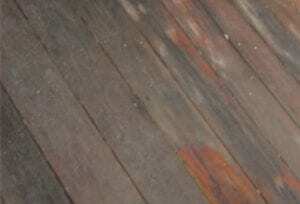 The biggest reason for a deck stain turning black is mildew. All wood surfaces need to be cleaned correctly prior to staining. The use of a quality wood cleaner and pressure washer or scrub brush is necessary to remove all the contaminants like dirt, grime, mold, mildew, and graying. When contaminants are left in the wood pores and stain is applied a whole host of problems can occur. Mildew can begin to grow underneath the deck stain, which causes discoloring. This can also lead to rot and decay because if there is mildew there is also moisture present. Here at DeckStainHelp.com, we take pride in the fact that our people come to us for professional deck staining tips and tricks. As years before, we do not recommend you allow your deck to gray naturally from UV rays, as this damages the wood grain. Feel free to leave a comment or question below. 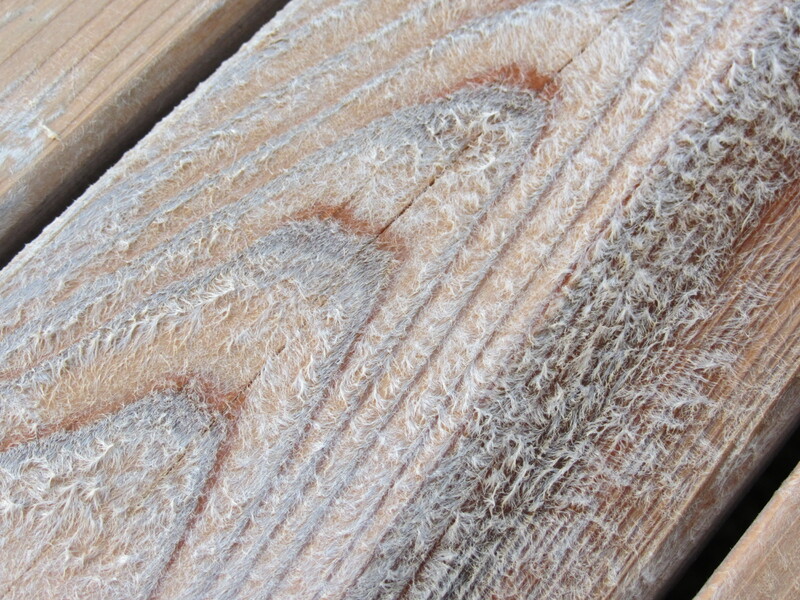 Most homeowners know that untreated wood left to the elements will gray over time. This graying is due to the sun’s UV rays. When the wood is not treated with the proper wood stain, it turns a rustic looking gray. Another enemy of exterior wood is moisture. This can cause the wood to warp, crack, splinter and eventually rot. To protect wood from water damage, a stain or sealer can be applied. When a stain with added color or toner is used it will not only protect the wood from water damage but also from sun graying. The added pigment of the toner helps block out the UV rays. When a sealer (clear stain) is used it will only provide water protection and no sun protection. For 2019 and beyond, Deckstainhelp.com vows to remain committed to being your go-to source for deck staining tips and latest industry news on the internet. Pesky wood fuzzies/furring may show up when you are staining your deck. If this happens, we have some suggestions for how to fix the problem. If you have any further recommendations we may have left out, please feel free to share them in the comments below. Also, we encourage you to share pictures of your completed super deck projects. Wood Fuzzies on Deck After Prepping? Why it happened and how to fix. Before applying a deck stain or sealer you should prep the wood properly first. Prepping is the most important part of the deck stain’s longevity. When evaluating the prepping process you should look at two options. Does the wood need to be cleaned or does an old stain need to be removed?